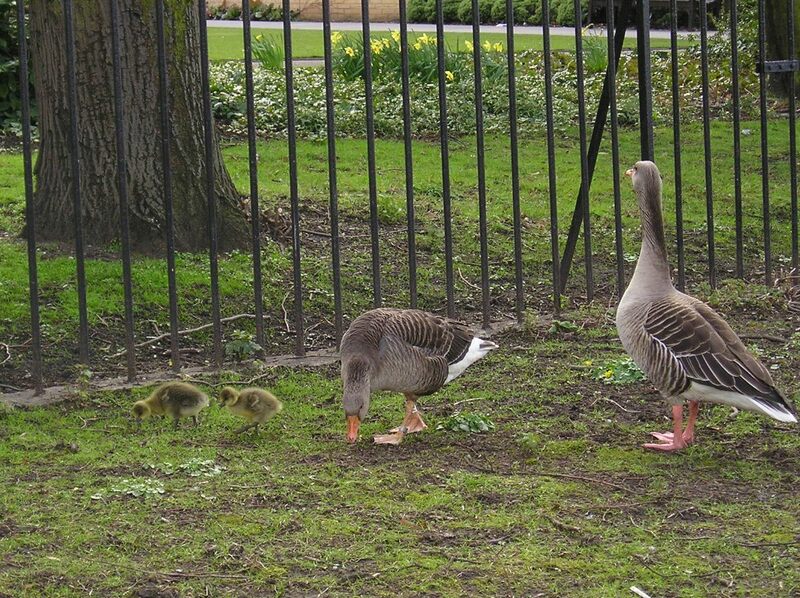 On this day ten years ago I was walking by the river, presumably on my way into town or back from town, and I stopped to take a few photos of geese wandering on the grass by the railings of the Memorial Gardens. The only photos I took that particular day. Eight photos of a group of geese, apparently a family of geese. Now, in 2016, the council has something called the Goose Management Scrutiny Review Task Group. It appears to have been set up in recent months. Every now and then there are letters to the York Press about the droppings of geese in Rowntree Park and other places. And presumably there’s also been a fair amount of lobbying of councillors on this issue for a Goose Management Scrutiny Review Task Group to be set up. I like the geese, enjoy the sight and sound of them in the riverside areas, and when they fly over my neighbourhood on their way to the river. They leave a bit of mess on the riverside, but not half as much as we do, and goose poo breaks down naturally whereas plastic bottles and the other rubbish we leave doesn’t. Officers confirmed they would be interested in a free trial of chemicals to use on grassed areas, details of which were tabled at the meeting. The Chair agreed he would contact the chemical companies to see if they would be willing to provide the Council with a free sample. It was suggested that a test area could then be identified, possibly in Memorial Gardens, to test if the chemicals were effective. Chemicals on the grass … mmm … anyone else a bit concerned? Personally I’d rather take my chances with the goose poo. presumably York is a wonderful place where all the problems presenting us in the real world have been solved, no housing shortage schools with class sizes of under20 Hospitals fully funded, and with all road work completed in there boredom the local councillors ar desperate to find something to do… dicuss..
PS Goose Poo Is Funny, however you say it..